THE BEADY EYE SAY’S. NO HUMAN IS EVER GOING TO LEAVE THIS PLANET SOON. WITH THE PLANET CRYING FOR SOME TLC WOULD IT NOT MAKE SOME COMMON SENSE TO PUT FUTURE SPACE EXPLORATION ON HOLD TILL WE CAN TRUST AI. Posted by bobdillon33@gmail.com in Space Exploration. Artificial Intelligence., INTERNATIONAL SPACE STATION:, Space Exploration., Space. Exploration of space is an expression of one of our finest aspects — curiosity. The fragility of humans, our aversion for risking human life, and the all-too-human need for consumables (food, water and oxygen) require vast amounts of money to pay for the extra engineering and multiple redundant systems we demand to reduce risk to astronauts, as well as for the vastly larger support crews needed to babysit every aspect of daily life during a manned space mission. In any exploration, reconnaissance dominates the earliest phases and realistically there is no choice between human and robotic exploration when it comes to travelling to any planet. Robotic exploration is the only realistic game in town. The International Space Station is no longer a platform for cutting-edge space science. Unmanned probes can explore Mars and other planets more cheaply and effectively than manned missions can. Robotic space programs are a far more cost-effective means of advancing our scientific knowledge of the universe. And a moon colony would be a silly destiny. Some scientists believe that artificial-intelligence software may enhance the capabilities of unmanned probes, but so far those capabilities fall far short of what is required for even the most rudimentary forms of field study. Building a manned base on the moon makes even less sense. Unmanned spacecraft can study the moon quite efficiently, as the Lunar Prospector probe has shown. It is not our destiny to build a moon colony any more than it is to walk on our hands. Considering the current limited range of human exploration the countdown to sending humans to Mars is light years away never mind the rest of the solar system. But robots aren’t heroes. No one throws a ticker-tape parade for a telescope. A program of purely robotic exploration is inadequate in addressing the important scientific issues that make the planets worthy of detailed study. But is the physical presence of people really required? Telepresence—the remote projection of human abilities into a machine—may permit field study on other planets without the danger and logistical problems associated with human spaceflight. THIS WILL NOT BE POSSIBLE UNTIL WE DEVELOPE FULLY ACCOUNTABLE ARTIFICAL INTELLIGENCE THAT IS TRUTHFUL AND TRUSTWORTHY. HUMAN SPACELIGHT is extremely expensive. A single flight of the space shuttle costs about $450 million. Even the most optimistic experts estimate that sending astronauts to the Red Planet would cost tens of billions of dollars. Other estimates run as high as $1 trillion. NASA LIKE HOLLOWOOD has learned a valuable lesson about marketing in the 21st century: to promote its programs, it must provide entertaining visuals and stories with compelling human characters. Vision is the most important sense used in a field study, and no real-time imaging system developed to date can match human vision, the technology is not yet available. Robots will never be replacements for people. Robotic spacecraft still need human direction, of course, if explorers Lewis and Clark were alive today, they would be sitting behind a computer screen. All exploration whether Robotic or otherwise will be worthless if we have an Earth that is void of people. The Beady eye looks at the enormous cost of space travel. INTERNATIONAL SPACE STATION:, Nasa Budget., Nasa., Space. In the last few days we all watched a few hundred people if that clapping themselves on the back all over a photo or photos of a planet 6 billion mile away that we never set foot upon. A technological achievement indeed. Knowledge is invaluable. Furthering our understanding of how the universe came into being, and ultimately how we came into being, cannot be measured as useful solely in terms of cost. The question is looking at the present state of our planet do we really need to be taking photos of planets that we will never step on. America was the first nation to land on the moon, but what tangible benefits to mankind have occurred as a result? The Hubble Telescope has sent back fascinating pictures of our universe. But again, how has this benefited anyone other than providing marvelous sights which awe us? The only life found on Mars, from the incredibly expensive probes, is some dead amoeba. All of it hasn’t led to any medical cures or any answers to the origins of the universe. There are many things in our world that have not discovered yet; do cures to AIDS and cancer ring a bell? And what about over coming poverty? The point is, space exploration is extremely expensive. I don’t feel that the solution’s to our problems can be solved by a space expedition. Perhaps it time to find a solution to what we don’t know in our world before exploring a different one. We simply don’t have the money or resources. Besides, if it’s unemployment you’re worried about, more people to devote their lives to over-coming the problems we know about, and not digging up more for us to “solve”. We all know that there are major crisis going on at your home planet. Global warming and the world wild economic crisis, which will cause the collapse of Capitalism not to mention a return to Barbarity – ISIS. Why rush off to space when we’ve can see our own planet yet? Why bother spending all this money on exploring space when we could be helping our own planet that us humans live on.? It’s a strong argument. Out in space there is virtually unlimited resources. It is all just a matter of collecting it and bringing it back, which granted will not be an easy task. Many discoveries and products have been developed from the knowledge gained from space exploration. For example, NASA created Velcro which is now used in many clothing items, bags and so forth. Non-stick pans and surfaces were also created as a result of space exploration. Space travel has also given us a lot of other new things for example the micro chip, the CAT scan and so on. Plastic was invented by material engineers working on the space program. The Internet was a joint military and NASA project. Satellites were some of the first venturers into space and are now a critical part of our society. Very important for hurricanes and dangerous storm systems. GPS allows Google to track you ever movement. If we compared space exploration to other areas of government spending (e.g. military), the cost of space exploration simply isn’t ridiculously high. It’s about $10,000 to put a pound of anything into a near-earth orbit. To put a pound of anything on the moon costs about 10 times as much. It use to costs $500 to $700 million every time the shuttle flies combined with overall cost yielding a per-flight cost of nearly $1.7 billion. The average cost to launch a Space Shuttle is about $450 million per mission. Billionaire space tourists have flown to the space station at a reputed price of $20 million per head. The space station costs upward of $100 billion. So was the shuttle program worth the 40 years (10 years of development and 30 years of flight) of the $209 billion that NASA and the nation poured into it? That probably depends on your priorities and your point of view. In 1966, NASA’s budget was $5.9 billion (4.4 percent of the federal budget). By 1972, Nixon had cut it to $3.4 billion (1.6 percent of the budget). To Day its less than one half of one penny out of each dollar the national government spends goes to NASA. It’s still a lot of money—about 17.7 billion dollars. And in the four decades since, NASA’s budget has continued to decrease as a proportion of national spending. The agency got $18.45 billion in fiscal year 2011, less than 0.5 percent of the federal budget. Space exploration isn’t cheap. Let’s put those trillions of dollars to good use here on Earth, where it could change the lives of millions. Send probes to space, but spend the money here on Earth. For me the real value lies in we are starting to see how small and fragile we are out there floating in space, maybe, just maybe we will not be so prone to abusing our one true home. To put it in perspective think about this: Apple earns $325,000 every minute. The next and last step of human evolution is overcoming the mind and learning the truth of life. The Beady eye pays homage to Hubble. As Horizon fly’s pass Pluto poor old Hubble is left in the dark. Launched aboard the shuttle Discovery 25 years ago on the April 24, it had its vision restored in December 1993. Orbiting the Earth for over two decades, Hubble has helped to answer some of the most compelling astronomical questions of our time – and uncovered mysteries we never knew existed. Investigating everything from black holes to planets around other stars, Hubble has changed the face of astronomy, ushering in a new chapter of humanity’s exploration of the universe. Over 100 Terabytes of observations all captured in digital files. Astronomers have used all those observations to generate over 12,800 scientific papers, making the Hubble one of the most productive scientific instruments ever designed and built. There are no rockets or thrusters on board the Hubble. To change directions, it spins reaction wheels that, thanks to Newton’s Third Law of Motion, make the telescope spin in the opposite direction. The wheels spin at about the speed of a clock’s minute hand, turning 90 degrees in 15 minutes. Hubble operates on only 2,800 W, a little more than an electric range’s largest burner on high. The telescope gets all its electricity from a pair of solar panels that measure approximately 23 х 9 ft (each). Engineers gave Hubble a pointing accuracy of 0.007 arc seconds, which is analogous to aiming a laser and hitting a dime 200 miles away. 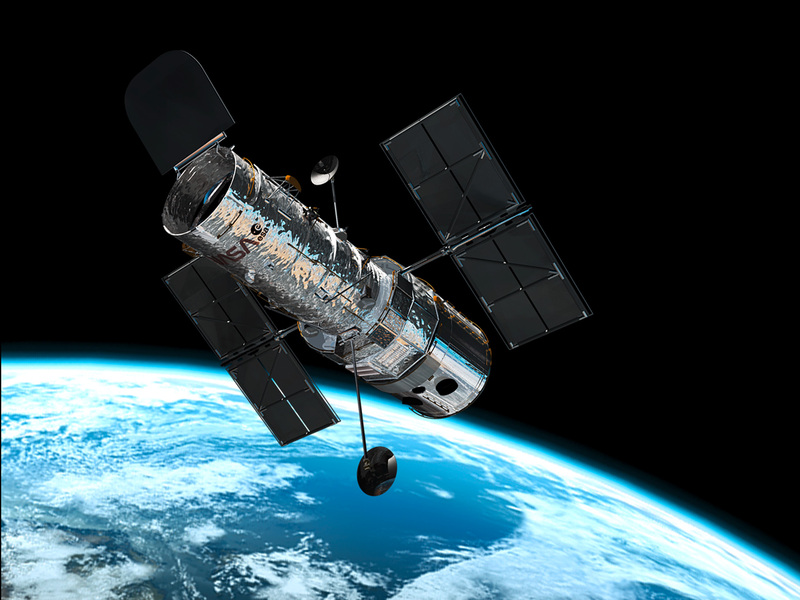 The most distant objects Hubble has seen are 13.4 billion light years. The Hubble takes only black-and-white images. The spectacular color images you see from the Hubble are made by combining two or more black-and-white exposures through colored filters. Then, when the image is further processed, colors matching the filters are added. Hubble helped construct the largest scale 3-D maps scientists have of where dark matter is distributed in the universe. Also, by helping to find out the mass of Eris, which is 27 percent more massive than Pluto, the realization that similar bodies might lurk in the Kuiper Belt and beyond it helped demote Pluto and similar objects to dwarf planet status. By gazing at star-forming regions such as the Orion Nebula, Hubble was able to show that protoplanetary disks of gas and dust are ubiquitous around many young stars. Gamma ray bursts. Hubble helped discover these bursts typically occur in galaxies that were actively forming stars and were low in metallicity. The comet Shoemaker-Levy 9 collided spectacularly with Jupiter in 1994, an impact Hubble captured in all its startling glory. Hubble may have helped solve the mystery of how old the universe is, but it unexpectedly turned up an even more profound one — the fact that the rate of the universe’s expansion is not slowing down or even constant, but is inexplicably accelerating. Hubble discovered that super-massive black holes probably lurk in every galaxy that has a bulge of stars at its center. Hubble has made some important advances in our research into alien worlds, such as determining the composition of the atmosphere of an exoplanet for the first time and actually imaging the visible light of Fomalhaut b.
Hubble helped refine estimates of the universe’s age down to roughly 13.75 billion years, a result that not only plays a role in modeling how our universe has evolved over time, but also in our understanding other seemingly unrelated cosmic parameters, such as the mass of neutrinos. It’s re-written a lot of what we know. Re-engineer humans for a better planet.